Gold prospecting and mining, selling American Hand Made by prospectors themselves and selling there wares to people who what quality tools that work. The high banker/power sluice you see in the above pictures is one we designed based on published research from Yukon placer recovery operations. I wanted a high banker that could process more material than the small scale mining ones currently available, and yet still have a high rate of recovery for fine gold. In addition, I wanted it to be light weight, low cost and heavy duty. As development progressed, heavy duty won out over light weight and low cost. I decided that something durable and easy to transport would add value and more than offset some extra weight and cost. There are many versions of finishing, separation and classification sluices or equipment that currently exist for extracting gold from the raw material that a prospector has collected during dredging, shoveling and/or sniping activities. 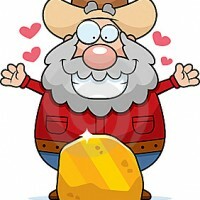 Catch-it-II is for the prospector that has a pile of classifieds he wants to get the finest Gold dust out of. There are no others that can catch-it like this American made high quality piece of mining equipment.